Drama is serious fun at Mount Pleasant High School, with a year-round program featuring a fall play, student-directed (and many student-written) one-act festival and the spring show. The cast of Mary Poppins at Mount Pleasant High School. Photo courtesy of MPHS Drama. This year’s spring show is the timeless Mary Poppins, based on the stories of R.L. Travers and the 1964 Walt Disney film. 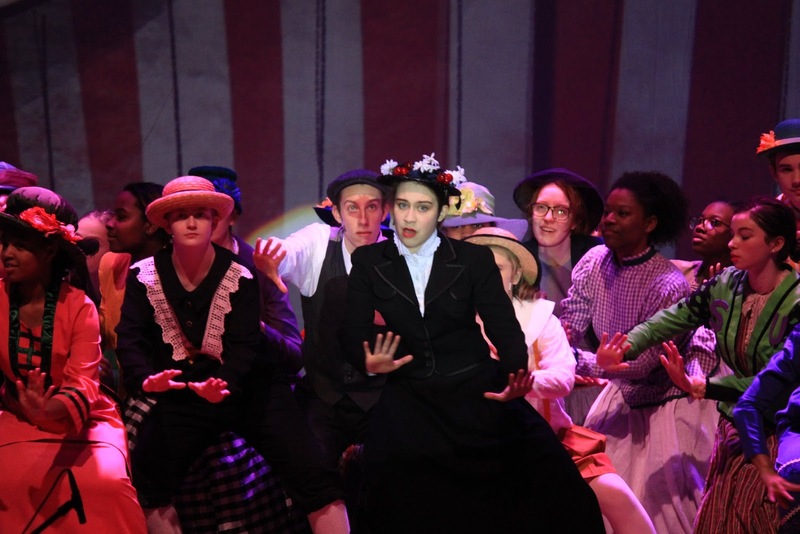 The expansive cast, orchestra and crew includes a record 24 seniors involved in the production. Many of the players have roots in prior Mount productions as well as those of other local performing arts staples, like Wilmington Drama League. Drama is a community endeavor at Mount. While the school funds the staff, many other daunting expenses — such as securing the rights to perform the plays, costume rentals, lights and other tech — are all underwritten by volunteer fundraising efforts (raffles, concessions, program ads, etc.). Many, many volunteer hands join together to present these gems to us. Supercalifragilisticexpialidocious showcased the captivating costumery and choreography, and the catchy classic had parents and children in the audience irresistibly singing and bobbing along. Brynn’s first experience with this mouthful was a delight to share in! Throughout the play, she bonded with child characters Jane and Michael Banks and quietly encouraged their father that Mary Poppins was in fact teaching them manners...with fun!